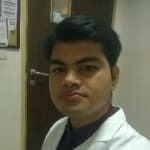 Mr. Satyabrata Panigrahi is a trusted Speech Therapist in Koramangala, Bangalore. He has over 5 years of experience as a Speech Therapist. He is a qualified Master of Hospital Administration, Bachelor of Audiology & Speech Language Pathology (B.A.S.L.P), MASTER IN AUDIOLOGY AND SPEECH LANGUAGE PATHOLOGY . You can consult Mr. Satyabrata Panigrahi at NASEEMA INSTITUTE OF SPEECH AND HEARING in Koramangala, Bangalore. Don’t wait in a queue, book an instant appointment online with Mr. Satyabrata Panigrahi on Lybrate.com. Lybrate.com has a number of highly qualified Speech Therapists in India. You will find Speech Therapists with more than 31 years of experience on Lybrate.com. Find the best Speech Therapists online in Gurgaon. View the profile of medical specialists and their reviews from other patients to make an informed decision. Sir, my mother use hearing aid but few days ago she got MRI done in which all metals including hearing aid was removed only gold ornaments were allowed in MRI. After the scan she feels that hearing is affected please suggest me how can we help her improve her hearing. Radiologists always advice to remove all the electronic prosthesis, ornaments and metals for proper imaging. Coming to the point the MRI machine while on work can generate upto 110 decibel noise, which is high and can damage the hearing. Now a days sofisticated silent scanner systems are used in some places, better to go for that. As she was using the hearing aid let her continue the same, if it's a programmable hearing aid and covers the range it can be reporogrammed according to the new loss level. I have severe problem in ear. swelling and pain in every 2_3 months its back. Can't hear properly meanwhile. Thanks. Sincerely I want to advice you to go to nearest ENT available and consult in person don't waste time in predicting something and self diagnosis should be avoidable. If possible go for hearing test (pure tone audiometry )and middle ear testing for ruling out any infection (tympanometry. GOOD LUCK. My wife is 25 years old and recently I have noticed clock ticking like Sound coming from her head. This happens only when she changes positions of sleep for like 2 seconds and only when she is really asleep. If she is little bit conscious while changing her position of sleep, no sound comes. She is completely unaware of it as she is asleep. It's very disturbing as I can't sleep if I hear any weird sound of slightest frequency. It's not snoring, it's non vocal. Should I be worried? It's called objective tinnitus (pulsatile in nature). It can be due to various causes. Suggestion is without wasting time get MRI scan and angiogram of heart .Consult with Head and neck surgeon near by your place and cardiologist. If tht comes normal then all other causes are not serious. Don't waste time please to get this done. Hi My name is Bala. I am facing problem with my ear I think water went inside while taking head bath. It is farming puss inside my ear every time I clean my ear puss is coming and little hearing problem also I am facing. Best way is to consult E.n.t as soon as possible, ask the doctor to show you the endoscopic view of your earcanal and eardrum. He will guide you how to proceed, do not jus google what the doctor says. Google things are jus opinions but doctor is practicing in real life. So follow what he says. U can take second opinion from Lybrate after consultation. Due to hearing or watching videos through earphones, I have some hearing problem not too much but little small. Please give proper suggestion. You can go through articles online which says damage happens in microstructures of inner ear when we are getting exposed to noise from day one. But these are at the level of micro structures so wr think we do not have loss. Usually we get to know we are having loss when its get worse. Apart from these medical facts, you jus get one things without delay you have to go for audiometry test (Pta, speech audiometry. That will give you the exact amount of loss you are having now. Better to avoid listening through earphones and use in loudspeaker mode with moderate sound level. Do not go beyond the pemitted sound level while using ear phones. You can see the alert pop up message whenever you go beyond the permitted level. If not install Volume limiter app from google store. Give feedback if it helps. Thanks. Me stammering problem and my tongue tie so this disease a big problem in my life. Hi, It can be managed easily through speech therapy and some relaxation techniques. You can consult me through Lybrate. Thank you. Dear sir My cousin sister Deaf and dumb. She is not able to speak and listen. Can it possible treatment. If any surgery and treatment is possible please help and guide me. Where and how it's possible. Dear Lybrate user, The process is when you listen to sounds ,then only you vl b able to speak ,that should happen with in developmental age (with in 5 to 7 years of age). Now it's late but you can go for hearing check up (audiometry ,BERA test) then according to the loss audiologist will suggest you whether to go for hearing aids or cochlear implant .Keep in mind auditory training is a must after any machine or implant in this case. I request you when you see person like this send them to doctors in early age, do not wait for long time. Hi, Please suggest otitis media kya h kya is mai sudden hearing loss hota hai please help me. Middle ear gale ke upri hisse ke saath juda hua h ,so kabhi kabhi naak se ya phir gale se fluid middle ear me chala Jata h ek tube connection ke through, jo ki unidirectional hota h.so Wahi fluid middle me rehke infected hota h aur kisi v rasta na nikalte hue bahar din agar untreated Raha to Kaan ki parda phod ke ata h. So jyada der Na karte hue E.n.t doctor ke saath consult kar Lena chahiye aur steam inhalation bhi karna chahiye jiska koi esi side effect nahi hai. Sir, my cousin's child having a mute and deaf problem by birth. When I saw the doctor at my native (Brahmapur, odissa) he says the left hear have a hearing sensitivity of 70dbm and right 90dbm. Sir, is it treatable to talk& hear like normal persons. if its sensorineural hearing loss then one and only management is hearing aid along with speech therapy as early as possible. u can opt for cochlear implant also ..for further details consult with me . There are various treatment methods available for the cure of tinnitus. Use of oral medication is one of the ways to cure tinnitus. In addition to that there are various therapies given to the patient. Tinnitus retraining therapy and hypnotherapy are specially designed for the treatment of tinnitus. The same modes of treatment may not be effective on a different individual. Tinnitus can be controlled by various diet factors and environmental factors. A diet has no direct relation to tinnitus, but a complete diet results in a healthy body and perfect hearing ability. Consumption of salt: the tinnitus may get worsens with the excess intake of salt. Sugar level in the body: an imbalance in the sugar levels will affect the auditory system and brain cells thereby worsening the hearing disorder. Flavor enhancers: flavor enhancers present in pre packaged food are great harm to our body and also enhance the hearing disorder. So, avoid eating pre-packaged food. Blood pressure: maintain a normal blood pressure. Caffeine and nicotine: both of them are harmful to the body in excess quantities. Avoid intake of caffeine and nicotine. Avoid exposure to loud noise and strictly avoid absolute silence. Subjective tinnitus can be treated using melatonin for people with sleep disturbance. Lidocaine injection into the inner ear suppresses tinnitus. Older benzodiazepines, tricyclics in small doses are sometimes used for tinnitus. Electrical stimulation: transcranial magnetic stimulation, transcutaneous electrical nerve stimulation, direct stimulation of auditory cortex by implanted electrodes, vagus nerve stimulation or ultrasonic bone-conduction external acoustic stimulation have shown to improve tinnitus. Use of hearing aid can stop tinnitus. Surgery repair of the perilymph fistula, external sound low-pitched sound treatment, tinnitus retraining therapy, auditive stimulation therapy and psychological cognitive behavioral therapy. Tinnitus retraining therapy (trt) is one form of potential habituation therapy designed for patients with chronic subjective tinnitus. Tinnitus retraining therapy involves the close co-operation with hearing professionals. The therapy aims to teach the brain to ignore the noise in the ear by habituation with the tinnitus. The universally accepted model or tinnitus, the neurophysiologic model, considers tinnitus as an auditory nervous system problem and may involve the limbic and autonomic nervous systems. As per this model, the treatment of tinnitus should focus mainly on the limbic and autonomic nervous systems and the tinnitus sensation should give only secondary attention. The goal of trt is achieved in two strategies. The first strategy involves the removal of any negative thought or fears that may be associated with tinnitus perception. This is achieved by direct counseling with a structured program of patient education with a perspective to eliminate or at least decrease the patient's reaction to any perceived tinnitus. Once the first strategy is implemented successfully the second strategy can be taken into consideration. The second strategy involves the removal of the tinnitus from conscious perception and is done through sound therapy. Sound therapy uses constant low level, broad-band background sound to reduce the detectability of tinnitus at the subconscious level. This situation has to be maintained for one to two years to achieve retraining of the tinnitus signal processing mechanism. This therapy offers hope to sufferers who are willing to take the time and make the effort to learn and implement it. Tinnitus retraining therapy can restore totally or partially the normal level of sensitivity to sound. Earwax removal can be done to cure the condition. A nasal spray with glycerin and salt in warm water can give some relief. Magnesium levels have some effect on tinnitus. Coffee, tea and other substances with caffeine can deplete magnesium levels. Alcohol is another substance that can deplete magnesium levels that has also been linked to tinnitus. Magnesium deficiency may make the people anxiety prone and hypersensitive to stimuli such as loud noises and bright lights. Avoiding exposure to loud noises may help tinnitus. Avoiding high salicylate foods including; almonds, apples, apricots, berries, cherries, cucumbers, grapes, nectarines, oranges, peaches, pickles, plums, raisins, tomatoes and wine can have some effect on tinnitus. If the tinnitus is a side effect of the medications has tinnitus, they should consult the doctors to see if their ear noises could be from a side effect of the medication.